What OpenFabrics-based components does Open MPI have? Does Open MPI support iWARP? Does Open MPI support RoCE (RDMA over Converged Ethernet)? I have an OFED-based cluster; will Open MPI work with that? Where do I get the OFED software from? Isn't Open MPI included in the OFED software package? Can I install another copy of Open MPI besides the one that is included in OFED? What versions of Open MPI are in OFED? Why are you using the name "openib" for the BTL name? Is the mVAPI-based BTL still supported? How do I specify to use the OpenFabrics network for MPI messages? But wait -- I also have a TCP network. Do I need to explicitly disable the TCP BTL? How do I know what MCA parameters are available for tuning MPI performance? I'm experiencing a problem with Open MPI on my OpenFabrics-based network; how do I troubleshoot and get help? What is "registered" (or "pinned") memory? I'm getting errors about "error registering openib memory"; what do I do? How can a system administrator (or user) change locked memory limits? I'm still getting errors about "error registering openib memory"; what do I do? Open MPI is warning me about limited registered memory; what does this mean? I'm using Mellanox ConnectX HCA hardware and seeing terrible latency for short messages; how can I fix this? How much registered memory is used by Open MPI? Is there a way to limit it? How do I get Open MPI working on Chelsio iWARP devices? My bandwidth seems [far] smaller than it should be; why? Can this be fixed? How do I tune small messages in Open MPI v1.1 and later versions? How do I tune large message behavior in Open MPI the v1.2 series? How do I tune large message behavior in the Open MPI v1.3 (and later) series? How does the mpi_leave_pinned parameter affect large message transfers? How does the mpi_leave_pinned parameter affect memory management? How does the mpi_leave_pinned parameter affect memory management in Open MPI v1.2? How does the mpi_leave_pinned parameter affect memory management in Open MPI v1.3? How can I set the mpi_leave_pinned MCA parameter? I got an error message from Open MPI about not using the default GID prefix. What does that mean, and how do I fix it? What subnet ID / prefix value should I use for my OpenFabrics networks? How do I set my subnet ID? In a configuration with multiple host ports on the same fabric, what connection pattern does Open MPI use? I'm getting lower performance than I expected. Why? I get bizarre linker warnings / errors / run-time faults when I try to compile my OpenFabrics MPI application statically. How do I fix this? Can I use system(), popen(), or fork() in an MPI application that uses the OpenFabrics support? My MPI application sometimes hangs when using the openib BTL; how can I fix this? Does InfiniBand support QoS (Quality of Service)? Does Open MPI support InfiniBand clusters with torus/mesh topologies? How do I tell Open MPI which IB Service Level to use? How do I run Open MPI over RoCE? Does Open MPI support XRC? How do I specify the type of receive queues that I want OMPI to use? Does Open MPI support FCA? Does Open MPI support MXM? 1. What OpenFabrics-based components does Open MPI have? Open MPI supports the verbs and (starting in version 1.2) udapl APIs from the OpenFabrics Alliance (OFA) software stack. The OpenFabrics software stack supports both InfiniBand and iWARP networks. Note that the OpenFabrics Alliance used to be known as the OpenIB project -- so if you're thinking "OpenIB", you're thinking the right thing. Open MPI's support of the OpenFabrics stack is provided through the multiple different components; see the table below. Open MPI also supported the Mellanox VAPI (mVAPI) software stack through the v1.2 series. See this FAQ entry for more details on VAPI support. 2. Does Open MPI support iWARP? iWARP is fully supported as of the Open MPI v1.3 release. 3. Does Open MPI support RoCE (RDMA over Converged Ethernet)? RoCE is fully supported as of the Open MPI v1.4.4 release. For more details on how to run Open MPI over RoCE, see this FAQ entry. 4. I have an OFED-based cluster; will Open MPI work with that? OFED (OpenFabrics Enterprise Distribution) is basically the release mechanism for the OpenFabrics software packages. So OFED releases are officially tested and released versions of the OpenFabrics stacks. 5. Where do I get the OFED software from? The "Download" section of the OpenFabrics web site has links for the various OFED releases. Additionally, several InfiniBand vendors have their own releases of the OFED stack, customized for their hardware and/or support requirements. Consult with your IB vendor for more details. 6. Isn't Open MPI included in the OFED software package? Can I install another copy of Open MPI besides the one that is included in OFED? Yes, Open MPI is included in the OFED software. And yes, you can easily install a later version of Open MPI on OFED-based clusters, even if you're also using the Open MPI that was included in OFED. You can simply download the Open MPI version that you want and install it to an alternate directory from where the OFED-based Open MPI was installed. You therefore have multiple copies of Open MPI that do not conflict with each other. Make sure you set the PATH and LD_LIBRARY_PATH variables to point to exactly one of your Open MPI installations at a time, and never try to run an MPI executable compiled with one version of Open MPI with a different version of Open MPI. Ensure to specify to build Open MPI with OpenFabrics support (e.g., use the "--with-openib=/usr/local/ofed" option to Open MPI's configure command, potentially replacing /usr/local/ofed with the path of your OFED installation). 7. What versions of Open MPI are in OFED? OFED 1.4.1: Open MPI v1.3.2. OFED 1.4: Open MPI v1.2.8. OFED 1.3.1: Open MPI v1.2.6. OFED 1.3: Open MPI v1.2.5. OFED 1.2: Open MPI v1.2.1. NOTE: A prior version of this FAQ entry specified that "v1.2ofed" would be included in OFED v1.2, representing a temporary branch from the v1.2 series that included some OFED-specific functionality. All of this functionality was included in the v1.2.1 release, so OFED v1.2 simply included than. Some public betas of "v1.2ofed" releases were made available, but this version was never officially released. OFED 1.1: Open MPI v1.1.1. OFED 1.0: Open MPI v1.1b1. 8. Why are you using the name "openib" for the BTL name? Before the iWARP vendors joined the OpenFabrics Alliance, the project was known as OpenIB. Open MPI's support for this software stack was originally written during this timeframe -- the name of the group was "OpenIB", so we named the BTL openib. Since then, iWARP vendors joined the project and it changed names to "OpenFabrics". Open MPI did not rename its BTL mainly for historical reasons -- we didn't want to break compatibility for users who were already using the openib BTL name in scripts, etc. 9. Is the mVAPI-based BTL still supported? Yes, but only through the Open MPI v1.2 series; mVAPI support was removed starting with v1.3. The mVAPI support is an InfiniBand-specific BTL (i.e., it will not work in iWARP networks), and reflects the prior generation of InfiniBand software stacks. However, the Open MPI team is doing no new work with mVAPI-based networks; all effort is being put into the openib BTL. We'll provide critical bug fixes for the mvapi BTL, but we consider the openib BTL to be the future of InfiniBand and iWARP support in Open MPI. Generally, much of the information contained in this FAQ category applies to both the OpenFabrics openib BTL and the mVAPI mvapi BTL -- simply replace openib with mvapi to get similar results. However, new features and options are continually being added to the openib BTL (and are being listed in this FAQ) that will not be back-ported to the mvapi BTL. So not all items in this FAQ will apply to the mvapi BTL. We encourage users to switch to the OFED-based stack if possible. 10. How do I specify to use the OpenFabrics network for MPI messages? Failure to specify the self BTL may result in Open MPI being unable to complete send-to-self scenarios (meaning that your program will run fine until a process tries to send to itself). See this FAQ entry for more details on selecting which MCA plugins are used at run-time. Finally, note that if the openib component is available at run time, Open MPI should automatically use it by default (ditto for self). Hence, it's usually unnecessary to specify these options on the mpirun command line. They are typically only used when you want to be absolutely positively definitely sure to use the specific BTL. 11. But wait -- I also have a TCP network. Do I need to explicitly disable the TCP BTL? No. See this FAQ entry for more details. 12. How do I know what MCA parameters are available for tuning MPI performance? 13. I'm experiencing a problem with Open MPI on my OpenFabrics-based network; how do I troubleshoot and get help? Which OpenFabrics version are you running? Please specify where you got the software from (e.g., from the OpenFabrics community web site, from a vendor, or it was already included in your Linux distribution). What distro and version of Linux are you running? What is your kernel version? What is the output of the ibv_devinfo command on a known "good" node and a known "bad" node? (NOTE: there must be at least one port listed as "PORT_ACTIVE" for Open MPI to work. If there is not at least one PORT_ACTIVE port, something is wrong with your OpenFabrics environment and Open MPI will not be able to run). What is the output of the ifconfig command on a known "good" node and a known "bad" node? (mainly relevant for IPoIB installations) Note that some Linux distributions do not put ifconfig in the default path for normal users; look for it in /sbin/ifconfig or /usr/sbin/ifconfig. If running under Bourne shells, what is the output of the "ulimit -l" command? If running under C shells, what is the output of the "limit | grep memorylocked" command? (NOTE: If the value is not "unlimited", this FAQ entry and this FAQ entry). Gather up this information and see this page about how to submit a help request to the user's mailing list. 14. What is "registered" (or "pinned") memory? The memory has been "pinned" by the operating system such that the virtual memory subsystem will not relocate the buffer (until it has been unpinned). The network adapter has been notified of the virtual-to-physical address mapping. These two factors allow network adapters to move data between the network fabric and physical RAM without involvement of the main CPU or operating system. Note that many people say "pinned" memory when they actually mean "registered" memory. However, a host can only support so much registered memory, so it is treated as a precious resource. Additionally, the cost of registering (and unregistering) memory is fairly high. Open MPI takes aggressive steps to use as little registered memory as possible (balanced against performance implications, of course) and mitigate the cost of registering and unregistering memory. 15. I'm getting errors about "error registering openib memory"; what do I do? libibverbs: Warning: RLIMIT_MEMLOCK is 32768 bytes. This will severely limit memory registrations. Linux kernel module parameters that control the amount of available registered memory are set too low; see this FAQ entry. System / user needs to increase locked memory limits: see this FAQ entry and this FAQ entry. 16. How can a system administrator (or user) change locked memory limits? where "<number>" is the number of bytes that you want user processes to be allowed to lock by default (presumably rounded down to an integral number of pages). "<number>" can also be "unlimited". where "<number>" is the maximum number of bytes that you want user processes to be allowed to lock (presumably rounded down to an integral number of pages). "<number>" can also be "unlimited". Per-user default values are controlled via the ulimit (or limit in csh) command. The default amount of memory allowed to be locked will correspond to the "soft" limit set in /etc/security/limits.d/ (or limits.conf -- see above); users cannot use ulimit (or limit in csh) to set their amount to be more than the hard limit in /etc/security/limits.d (or limits.conf). This effectively sets their limit to the hard limit in /etc/security/limits.d (or limits.conf). Alternatively, users can set a specific number instead of "unlimited," but this has limited usefulness unless a user is aware of exactly how much locked memory will require (which is difficult to know since Open MPI manages locked memory behind the scenes). It is important to realize that this must be set in all shells where Open MPI processes using OpenFabrics will be run. For example, if you are using rsh or ssh to start parallel jobs, it will be necessary to set the ulimit in your shell startup files so that it is effective on the processes that are started on each node. 17. I'm still getting errors about "error registering openib memory"; what do I do? Your memory locked limits are not actually being applied for interactive and/or non-interactive logins. You are starting MPI jobs under a resource manager / job scheduler that is either explicitly resetting the memory limited or has daemons that were (usually accidentally) started with very small memory locked limits. In this case, the user noted that the default configuration on his Linux system did not automatically load the pam_limits.so upon rsh-based logins, meaning that the hard and soft limits were not set. Make sure that the resource manager daemons are started with unlimited memlock limits (which may involve editing the resource manager daemon startup script, or some other system-wide location that allows the resource manager daemon to get an unlimited limit of locked memory). Otherwise, jobs that are started under that resource manager will get the default locked memory limits, which are far too small for Open MPI. The files in limits.d (or the limits.conf file) does not usually apply to resource daemons! The limits.s files usually only applies to rsh or ssh-based logins. Hence, daemons usually inherit the system default of maximum 32k of locked memory (which then gets passed down to the MPI processes that they start). To increase this limit, you typically need to modify daemons' startup scripts to increase the limit before they drop root privliedges. Some resource managers can limit the amount of locked memory that is made available to jobs. For example, SLURM has some fine-grained controls that allow locked memory for only SLURM jobs (i.e., the system's default is low memory lock limits, but SLURM jobs can get high memory lock limits). See these FAQ items on the SLURM web site for more details: propagating limits and using PAM. Finally, note that some versions of SSH have problems with getting correct values from /etc/security/limits.d/ (or limits.conf) when using privilege separation. You may notice this by ssh'ing into a node and seeing that your memlock limits are far lower than what you have listed in /etc/security/limits.d/ (or limits.conf) (e.g., 32k instead of unlimited). Several web sites suggest disabling privilege separation in ssh to make PAM limits work properly, but others imply that this may be fixed in recent versions of Open SSH. If you do disable privilege separation in ssh, be sure to check with your local system administrator and/or security officers to understand the full implications of this change. See this Google search link for more information. 18. Open MPI is warning me about limited registered memory; what does this mean? OpenFabrics network vendors provide Linux kernel module parameters controlling the size of the size of the memory translation table (MTT) used to map virtual addresses to physical address. The size of this table controls the amount of physical memory that can be registered for use with OpenFabrics devices. At least some versions of OFED (community OFED, Mellanox OFED, and upstream OFED in Linux distributions) set the default values of these variables FAR too low! For example, in some cases, the default values may only allow registering 2 GB -- even if the node has much more than 2GB of physical memory. Mellanox has advised the Open MPI community to increase the log_num_mtt value (or num_mtt value), not the log_mtts_per_seg value (even though an IBM article suggests increasing the log_mtts_per_seg value). NOTE: Starting with OFED 2.0, OFED's default kernel parameter values should allow registering twice the physical memory size. 19. I'm using Mellanox ConnectX HCA hardware and seeing terrible latency for short messages; how can I fix this? Open MPI prior to v1.2.4 did not include specific configuration information to enable RDMA for short messages on ConnectX hardware. As such, Open MPI will default to the safe setting of using send/receive semantics for short messages, which is slower than RDMA. Enabling short message RDMA will significantly reduce short message latency, especially on ConnectX (and newer) Mellanox hardware. 20. How much registered memory is used by Open MPI? Is there a way to limit it? Open MPI uses registered memory in several places, and therefore the total amount used is calculated by a somewhat-complex formula that is directly influenced by MCA parameter values. It can be desirable to enforce a hard limit on how much registered memory is consumed by MPI applications. For example, some platforms have limited amounts of registered memory available; setting limits on a per-process level can ensure fairness between MPI processes on the same host. Another reason is that registered memory is not swappable; as more memory is registered, less memory is available for (non-registered) process code and data. When little unregistered memory is available, swap thrashing of unregistered memory can occur. User memory mpool_rdma_rcache_size_limit By default Open MPI will register as much user memory as necessary (upon demand). However, if mpool_rdma_cache_size_limit is greater than zero, it is the upper limit (in bytes) of user memory that will be registered. User memory is registered for ongoing MPI communications (e.g., long message sends and receives) and via the MPI_ALLOC_MEM function. Note that this MCA parameter was introduced in v1.2.1. Internal eager fragment buffers 2 x btl_openib_free_list_max x (btl_openib_eager_limit + overhead) A "free list" of buffers used in the openib BTL for "eager" fragments (e.g., the first fragment of a long message). Two free lists are created; one for sends and one for receives. By default, btl_openib_free_list_max is -1, and the list size is unbounded, meaning that Open MPI will try to allocate as many registered buffers as it needs. If btl_openib_free_list_max is greater than 0, the list will be limited to this size. Each entry in the list is approximately btl_openib_eager_limit bytes -- some additional overhead space is required for alignment and internal accounting. btl_openib_eager_limit is the maximum size of an eager fragment. Internal send/receive buffers 2 x btl_openib_free_list_max x (btl_openib_max_send_size + overhead) A "free list" of buffers used for send/receive communication in the openib BTL. Two free lists are created; one for sends and one for receives. By default, btl_openib_free_list_max is -1, and the list size is unbounded, meaning that Open MPI will allocate as many registered buffers as it needs. If btl_openib_free_list_max is greater than 0, the list will be limited to this size. Each entry in the list is approximately btl_openib_max_send_size bytes -- some additional overhead space is required for alignment and internal accounting. btl_openib_max_send_size is the maximum size of a send/receive fragment. Internal "eager" RDMA buffers btl_openib_eager_rdma_num x btl_openib_max_eager_rdma x (btl_openib_eager_limit + overhead) If btl_openib_user_eager_rdma is true, RDMA buffers are used for eager fragments (because RDMA semantics can be faster than send/receive semantics in some cases), and an additional set of registered buffers are created (as needed). Each MPI process will use RDMA buffers for eager fragments up to btl_openib_eager_rdma_num MPI peers. Upon receiving the btl_openib_eager_rdma_threshhold'th message from an MPI peer process, if both sides have not yet setup btl_openib_eager_rdma_num sets of eager RDMA buffers, a new set will be created. The set will contain btl_openib_max_eager_rdma buffers; each buffer will be btl_openib_eager_limit bytes (i.e., the maximum size of an eager fragment). In general, when any of the individual limits are reached, Open MPI will try to free up registered memory (in the case of registered user memory) and/or wait until message passing progresses and more registered memory becomes available. See this FAQ entry for information on how to set MCA parameters at run-time. 21. How do I get Open MPI working on Chelsio iWARP devices? iWARP support is only available in version Open MPI v1.3 or greater. # proper ethernet interface name for your T3 (vs. ethX). Open MPI will work without any specific configuration to the openib BTL. Users wishing to performance tune the configurable options may wish to inspect the receive queue values. Those can be found in the "Chelsio T3" section of mca-btl-openib-hca-params.ini. 22. I'm getting "ibv_create_qp: returned 0 byte(s) for max inline data" errors; what is this, and how do I fix it? 23. My bandwidth seems [far] smaller than it should be; why? Can this be fixed? Open MPI, by default, uses a pipelined RDMA protocol. Additionally, in the v1.0 series of Open MPI, small messages use send/receive semantics (instead of RDMA -- small message RDMA was added in the v1.1 series). For some applications, this may result in lower-than-expected bandwidth. However, Open MPI also supports caching of registrations in a most recently used (MRU) list -- this bypasses the pipelined RDMA and allows messages to be sent faster (in some cases). For version the v1.1 series, see this FAQ entry for more information about small message RDMA, its effect on latency, and how to tune it. NOTE: The mpi_leave_pinned parameter was broken in Open MPI v1.3 and v1.3.1 (see this announcement). mpi_leave_pinned functionality was fixed in v1.3.2. This will enable the MRU cache and will typically increase bandwidth performance for applications which reuse the same send/receive buffers. NOTE: The v1.3 series enabled "leave pinned" behavior by default when applicable; it is usually unnecessary to specify this flag anymore. 24. How do I tune small messages in Open MPI v1.1 and later versions? Starting with Open MPI version 1.1, "short" MPI messages are sent, by default, via RDMA to a limited set of peers (for versions prior to v1.2, only when the shared receive queue is not used). This provides the lowest possible latency between MPI processes. However, this behavior is not enabled between all process peer pairs because it can quickly consume large amounts of resources on nodes (specifically: memory must be individually pre-allocated for each process peer to perform small message RDMA; for large MPI jobs, this can quickly cause individual nodes to run out of memory). Outside the limited set of peers, send/receive semantics are used (meaning that they will generally incur a greater latency, but not consume as many system resources). btl_openib_use_eager_rdma (default value: 1): These both default to 1, meaning that the small message behavior described above (RDMA to a limited set of peers, send/receive to everyone else) is enabled. Setting these parameters to 0 disables all small message RDMA in the openib BTL component. btl_openib_eager_rdma_threshold (default value: 16): This is the number of short messages that must be received from a peer before Open MPI will setup an RDMA connection to that peer. This mechanism tries to setup RDMA connections only to those peers who will frequently send around a lot of short messages (e.g., avoid consuming valuable RDMA resources for peers who only exchange a few "startup" control messages). btl_openib_max_eager_rdma (default value: 16): This parameter controls the maximum number of peers that can receive and RDMA connection for short messages. It is not advisable to change this value to a very large number because the polling time increase with the number of the connections; as a direct result, short message latency will increase. btl_openib_eager_rdma_num (default value: 16): This parameter controls the maximum number of pre-allocated buffers allocated to each peer for small messages. btl_openib_eager_limit (default value: 12k): The maximum size of small messages (in bytes). Note that long messages use a different protocol than short messages; messages over a certain size always use RDMA. Long messages are not affected by the btl_openib_use_eager_rdma MCA parameter. Also note that, as stated above, prior to v1.2, small message RDMA is not used when the shared receive queue is used. 25. How do I tune large message behavior in Open MPI the v1.2 series? Note that this answer generally pertains to the Open MPI v1.2 series. Later versions slightly changed how large messages are handled. Open MPI uses a few different protocols for large messages. Much detail is provided in this paper. The btl_openib_flags MCA parameter is a set of bit flags that influences which protocol is used; they generally indicate what kind of transfers are allowed to send the bulk of long messages. Specifically, these flags do not regulate the behavior of "match" headers or other intermediate fragments. Use send/receive semantics (1): Allow the use of send/receive semantics. Use PUT semantics (2): Allow the sender to use RDMA writes. Use GET semantics (4): Allow the receiver to use RDMA reads. Open MPI defaults to setting both the PUT and GET flags (value 6). Send the "match" fragment: the sender sends the MPI message information (communicator, tag, etc.) to the receiver using copy in/copy out semantics. No data from the user message is included in the match header. If RDMA reads are enabled and only one network connection is available between the pair of MPI processes, once the receiver has posted a matching MPI receive, it issues an RDMA read to get the message, and sends an ACK back to the sender when the transfer has completed. If the above condition is not met, then RDMA writes must be enabled (or we would not have chosen this protocol). The receiver sends an ACK back when a matching MPI receive is posted and the sender issues an RDMA write across each available network link (i.e., BTL module) to transfer the message. The RDMA write sizes are weighted across the available network links. For example, if two MPI processes are connected by both SDR and DDR IB networks, this protocol will issue an RDMA write for 1/3 of the entire message across the SDR network and will issue a second RDMA write for the remaining 2/3 of the message across the DDR network. The sender then sends an ACK to the receiver when the transfer has completed. NOTE: Per above, if striping across multiple network interfaces is available, only RDMA writes are used. The reason that RDMA reads are not used is solely because of an implementation artifact in Open MPI; we didn't implement it because using RDMA reads only saves the cost of a short message round trip, the extra code complexity didn't seem worth it for long messages (i.e., the performance difference will be negligible). Note that the user buffer is not unregistered when the RDMA transfer(s) is(are) completed. Send the "match" fragment: the sender sends the MPI message information (communicator, tag, etc.) and the first fragment of the user's message using copy in/copy out semantics. Send remaining fragments: once the receiver has posted a matching MPI receive, it sends an ACK back to the sender. The sender then uses copy in/copy out semantics to send the remaining fragments to the receiver. This protocol behaves the same as the RDMA Pipeline protocol when the btl_openib_min_rdma_size value is infinite. 26. How do I tune large message behavior in the Open MPI v1.3 (and later) series? The change to move the "intermediate" fragments to the end of the message was made to better support applications that call fork(). Specifically, there is a problem in Linux when a process with registered memory calls fork(): the registered memory will physically not be available to the child process (touching memory in the child that is registered in the parent will cause a segfault or other error). Because memory is registered in units of pages, the end of a long message is likely to share the same page as other heap memory in use by the application. If this last page of the large message is registered, then all the memory in that page -- to include other buffers that are not part of the long message -- will not be available to the child. By moving the "intermediate" fragments to the end of the message, the end of the message will be sent with copy in/copy out semantics and, more importantly, will not have its page registered. This increases the chance that child processes will be able to access other memory in the same page as the end of the large message without problems. btl_openib_rndv_eager_limit defaults to the same value as btl_openib_eager_limit (the size for "small" messages). It is a separate parameter in case you want/need different values. 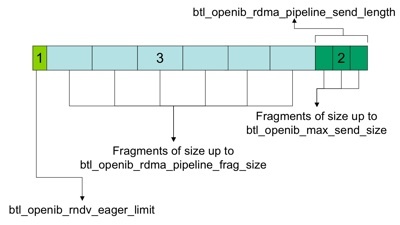 The btl_openib_min_rdma_size parameter was an absolute offset into the message; it was replaced by btl_openib_rdma_pipeline_send_length, which is a length. Note that messages must be larger than btl_openib_min_rdma_pipeline_size (a new MCA parameter to the v1.3 series) to use the RDMA Direct or RDMA Pipeline protocols. Messages shorter than this length will use the Send/Receive protocol (even if the SEND flag is not set on btl_openib_flags). 27. How does the mpi_leave_pinned parameter affect large message transfers? When mpi_leave_pinned is set to 1, Open MPI aggressively tries to pre-register user message buffers so that the RDMA Direct protocol can be used. Additionally, user buffers are left registered so that the de-registration and re-registration costs are not incurred if the same buffer is used in a future message passing operation. NOTE: Starting with Open MPI v1.3, mpi_leave_pinned is automatically set to 1 by default when applicable. It is therefore usually unnecessary to set this value manually. NOTE: The mpi_leave_pinned MCA parameter has some restrictions on how it can be set starting with Open MPI v1.3.2. See this FAQ entry for details. Leaving user memory registered when sends complete can be extremely beneficial for applications that repeatedly re-use the same send buffers (such as ping-pong benchmarks). Additionally, the fact that a single RDMA transfer is used and the entire process runs in hardware with very little software intervention results in utilizing the maximum possible bandwidth. Leaving user memory registered has disadvantages, however. Bad Things happen if registered memory is free()ed, for example -- it can silently invalidate Open MPI's cache of knowing which memory is registered and which is not. The MPI layer usually has no visibility on when the MPI application calls free() (or otherwise frees memory, such as through munmap() or sbrk()). Open MPI has implemented complicated schemes that intercept calls to return memory to the OS. Upon intercept, Open MPI examines whether the memory is registered, and if so, unregisters it before returning the memory to the OS. These schemes are best described as "icky" and can actually cause real problems in applications that provide their own internal memory allocators. Additionally, only some applications (most notably, ping-pong benchmark applications) benefit from "leave pinned" behavior -- those who consistently re-use the same buffers for sending and receiving long messages. It is for these reasons that "leave pinned" behavior is not enabled by default. Note that other MPI implementations enable "leave pinned" behavior by default. Also note that another pipeline-related MCA parameter also exists: mpi_leave_pinned_pipeline. Setting this parameter to 1 enables the use of the RDMA Pipeline protocol, but simply leaves the user's memory registered when RDMA transfers complete (eliminating the cost of registering / unregistering memory during the pipelined sends / receives). This can be beneficial to a small class of user MPI applications. 28. How does the mpi_leave_pinned parameter affect memory management? When mpi_leave_pinned is set to 1, Open MPI aggressively leaves user memory registered with the OpenFabrics network stack after the first time it is used with a send or receive MPI function. This allows Open MPI to avoid expensive registration / deregistration function invocations for each send or receive MPI function. Using an internal memory manager; effectively overriding calls to malloc(), free(), mmap(), munmap(), etc. Telling the OS to never return memory from the process to the OS. How these options are used differs between Open MPI v1.2 (and earlier) and Open MPI v1.3 (and later). 29. How does the mpi_leave_pinned parameter affect memory management in Open MPI v1.2? Be sure to read this FAQ entry first. Open MPI 1.2 and earlier on Linux used the ptmalloc2 memory allocator linked into the Open MPI libraries to handle memory deregistration. On Mac OS X, it uses an interface provided by Apple for hooking into the virtual memory system, and on other platforms no safe memory registration was available. The ptmalloc2 code could be disabled at Open MPI configure time with the option --without-memory-manager, however it could not be avoided once Open MPI was built. ptmalloc2 can cause large memory utilization numbers for a small number of applications and has a variety of link-time issues. Therefore, by default Open MPI did not use the registration cache, resulting in lower peak bandwidth. The inability to disable ptmalloc2 after Open MPI was built also resulted in headaches for users. Open MPI v1.3 handles leave pinned memory management differently. 30. How does the mpi_leave_pinned parameter affect memory management in Open MPI v1.3? With Open MPI 1.3, Mac OS X uses the same hooks as the 1.2 series, and most operating systems do not provide pinning support. However, the pinning support on Linux has changed. ptmalloc2 is now by default built as a standalone library (with dependencies on the internal Open MPI libopen-pal library), so that users by default do not have the problematic code linked in with their application. Further, if OpenFabrics networks are being used, Open MPI will use the mallopt() system call to disable returning memory to the OS if no other hooks are provided, resulting in higher peak bandwidth by default. Linking in libopenmpi-malloc will result in the OpenFabrics BTL not enabling mallopt() but using the hooks provided with the ptmalloc2 library instead. To revert to the v1.2 (and prior) behavior, with ptmalloc2 folded into libopen-pal, Open MPI can be built with the --enable-ptmalloc2-internal configure flag. Because mpi_leave_pinned behavior is usually only useful for synthetic MPI benchmarks, the never-return-behavior-to-the-OS behavior was resisted by the Open MPI developers for a long time. Ultimately, it was adopted because a) it is less harmful than imposing the ptmalloc2 memory manager on all applications, and b) it was deemed important to enable mpi_leave_pinned behavior by default since Open MPI performance kept getting negatively compared to other MPI implementations that enable similar behavior by default. 31. How can I set the mpi_leave_pinned MCA parameter? Prior to the v1.3 series, all the usual methods to set MCA parameters could be used to set mpi_leave_pinned. However, starting with v1.3.2, not all of the usual methods to set MCA parameters apply to mpi_leave_pinned. Due to various operating system memory subsystem constriaints, Open MPI must react to the setting of the mpi_leave_pinned parameter in each MPI process before MPI_INIT is invoked. Specifically, some of Open MPI's MCA parameter propagation mechanisms are not activated until during MPI_INIT -- which is too late for mpi_leave_pinned. Command line: See the example above. Environment variable: Setting OMPI_MCA_mpi_leave_pinned to 1 before invoking mpirun. Either the environment variable OMPI_MCA_mpi_leave_pinned or OMPI_MCA_mpi_leave_pinned_pipeline is set to a positive value (note that the "mpirun --mca mpi_leave_pinned 1 ..." command-line syntax simply results in setting these environment variables in each MPI process). Note that if either the environment variable OMPI_MCA_mpi_leave_pinned or OMPI_MCA_mpi_leave_pinned_pipeline is set to to "-1", then the above indicators are ignored and Open MPI will not use leave-pinned behavior. 32. I got an error message from Open MPI about not using the default GID prefix. What does that mean, and how do I fix it? What it usually means is that you have a host connected to multiple, physically separate OFA-based networks, at least 2 of which are using the factory-default subnet ID value (FE:80:00:00:00:00:00:00). Open MPI can therefore not tell these networks apart during its reachability computations, and therefore will likely fail. You need to reconfigure your OFA networks to have different subnet ID values, and then Open MPI will function properly. Please note that the same issue can occur when any two physically separate subnets share the same subnet ID value -- not just the factory-default subnet ID value. However, Open MPI only warns about the factory default subnet ID value because most users do not bother to change it unless they know that they have to. All this being said, note that there are valid network configurations where multiple ports on the same host can share the same subnet ID value. For example, two ports from a single host can be connected to the same network as a bandwidth multiplier or a high-availability configuration. For this reason, Open MPI only warns about finding duplicate subnet ID values, and that warning can be disabled. Setting the btl_openib_warn_default_gid_prefix MCA parameter to 0 will disable this warning. See this FAQ entry for instructions on how to set the subnet ID. Since Open MPI can utilize multiple network links to send MPI traffic, it needs to be able to compute the "reachability" of all network endpoints that it can use. Specifically, for each network endpoint, Open MPI calculates which other network endpoints are reachable. In OpenFabrics networks, Open MPI uses the subnet ID to differentiate between subnets -- assuming that if two ports share the same subnet ID, they are reachable from each other. If multiple, physically separate OFA networks use the same subnet ID (such as the default subnet ID), it is not possible for Open MPI to tell them apart and therefore reachability cannot be computed properly. 33. What subnet ID / prefix value should I use for my OpenFabrics networks? You can use any subnet ID / prefix value that you want. However, Open MPI v1.1 and v1.2 both require that every physically separate OFA subnet that is used between connected MPI processes must have different subnet ID values. For example, if you have two hosts (A and B) and each of these hosts has two ports (A1, A2, B1, and B2). If A1 and B1 are connected to Switch1, and A2 and B2 are connected to Switch2, and Switch1 and Switch2 are not reachable from each other, then these two switches must be on subnets with different ID values. 34. How do I set my subnet ID? It depends on what Subnet Manager (SM) you are using. Note that changing the subnet ID will likely kill any jobs currently running on the fabric! OpenSM: The SM contained in the OpenFabrics Enterprise Distribution (OFED) is called OpenSM. The instructions below pertain to OFED v1.2 and beyond; they may or may not work with earlier versions. The -o option causes OpenSM to run for one loop and exit. The -c option tells OpenSM to create an "options" text file. The OpenSM options file will be generated under /var/cache/opensm/opensm.opts. Open the file and find line with subnet_prefix. Replace the default value prefix with new one. OpenSM will automatically load the options file from the cache repository and will use new prefix. Cisco High Performance Subnet Manager (HSM): The Cisco HSM has a console application that can dynamically change various characteristics of the IB fabrics without restarting. The Cisco HSM works on both the OFED InfiniBand stack and an older, Cisco-proprietary "Topspin" InfiniBand stack. Please consult the Cisco HSM (or switch) documentation for specific instructions on how to change the subnet prefix. Other SM: Consult that SM's instructions for how to change the subnet prefix. 35. In a configuration with multiple host ports on the same fabric, what connection pattern does Open MPI use? When multiple active ports exist on the same physical fabric between multiple hosts in an MPI job, Open MPI will attempt to use them all by default. Open MPI makes several assumptions regarding active ports when establishing connections between two hosts. Active ports that have the same subnet ID are assumed to be connected to the same physical fabric -- that is to say that communication is possible between these ports. Active ports with different subnet IDs are assumed to be connected to different physical fabric -- no communication is possible between them. It is therefore very important that if active ports on the same host are on physically separate fabrics, they must have different subnet IDs. Otherwise Open MPI may attempt to establish communication between active ports on different physical fabrics. The subnet manager allows subnet prefixes to be assigned by the administrator, which should be done when multiple fabrics are in use. The following is a brief description of how connections are established between multiple ports. During initialization, each process discovers all active ports (and their corresponding subnet ID) on the local host and shares this information with every other process in the job. Each process then examines all active ports (and the corresponding subnet ID) of every other process in the job and makes a one-to-one assignment of active ports within the same subnet. If the number of active ports within a subnet differ on the local process and the remote process, then the smaller number of active ports are assigned, leaving the rest of the active ports out of the assignment between these two processes. Connections are not established during MPI_INIT, but the active port assignment is cached and upon the first attempted use of an active port to send data to the remote process (e.g., via MPI_SEND), a queue pair (i.e., a connection) is established between these ports. Active ports are used for communication in a round robin fashion so that connections are established and used in a fair manner. NOTE: This FAQ entry generally applies to v1.2 and beyond. Prior to v1.2, Open MPI would follow the same scheme outlined above, but would not correctly handle the case where processes within the same MPI job had differing numbers of active ports on the same physical fabric. 36. I'm getting lower performance than I expected. Why? Measuring performance accurately is an extremely difficult task, especially with fast machines and networks. Be sure to read this FAQ entry for many suggestions on benchmarking performance. Pay particular attention to the discussion of processor affinity and NUMA systems -- running benchmarks without processor affinity and/or on CPU sockets that are not directly connected to the bus where the HCA is located can lead to confusing or misleading performance results. 37. I get bizarre linker warnings / errors / run-time faults when I try to compile my OpenFabrics MPI application statically. How do I fix this? Fully static linking is not for the weak, and is not recommended. But it is possible. Read both this FAQ entry and this FAQ entry in their entirety. 38. Can I use system(), popen(), or fork() in an MPI application that uses the OpenFabrics support? The answer is, unfortunately, complicated. Be sure to also see this FAQ entry as well. If you have a Linux kernel before version 2.6.16: no. Some distros may provide patches for older versions (e.g, RHEL4 may someday receive a hotfix). If you have a version of OFED before v1.2: sort of. Specifically, newer kernels with OFED 1.0 and OFED 1.1 may generally allow the use of system() and/or the use of fork() as long as the parent does nothing until the child exits. btl_openib_have_fork_support: This is a "read-only" MCA value, meaning that users cannot change it in the normal ways that MCA parameter values are set. It can be queried via the ompi_info command; it will have a value of 1 if this installation of Open MPI supports fork(); 0 otherwise. Negative values: try to enable fork support, but continue even if it is not available. Zero: Do not try to enable fork support. Positive values: Try to enable fork support and fail if it is not available. Hence, you can reliably query OMPI to see if it has support for fork() and force OMPI to abort if you request fork support and it doesn't have it. Which will abort if OMPI's openib BTL does not have fork support. All this being said, even if Open MPI is able to enable the OpenFabrics fork() support, it does not mean that your fork()-calling application is safe. In general, if your application calls system() or popen(), it will likely be safe. However, note that arbitrary fork() support is not supported in the OpenFabrics software stack. If you use fork() in your application, you must not touch any registered memory before calling some form of exec() to launch another process. Doing so will cause an immediate seg fault / program crash. It is important to note that memory is registered on a per-page basis; it is therefore possible that your application may have memory co-located on the same page as a buffer that was passed to an MPI communications routine (e.g., MPI_Send() or MPI_Recv()) or some other internally-registered memory inside Open MPI. You may therefore accidentally "touch" a page that is registered without even realizing it, thereby crashing your application. This is unfortunately no way around this issue; it was intentionally designed into the OpenFabrics software stack. Please complain to the OpenFabrics Alliance that they should really fix this problem! 39. My MPI application sometimes hangs when using the openib BTL; how can I fix this? Starting with v1.2.6, the MCA pml_ob1_use_early_completion parameter allows the user (or administrator) to turn off the "early completion" optimization. Early completion may cause "hang" problems with some MPI applications running on OpenFabrics networks, particularly loosely-synchronized applications that do not call MPI functions often. The default is 1, meaning that early completion optimization semantics are enabled (because it can reduce point-to-point latency). See Open MPI ticket #1224 for further information. NOTE: This FAQ entry only applies to the v1.2 series. This functionality is not required for v1.3 and beyond because of changes in how message passing progress occurs. Specifically, this MCA parameter will only exist in the v1.2 series. 40. Does InfiniBand support QoS (Quality of Service)? InfiniBand QoS functionality is configured and enforced by the Subnet Manager/Administrator (e.g., OpenSM). Open MPI (or any other ULP/application) sends traffic on a specific IB Service Level (SL). This SL is mapped to an IB Virtual Lane, and all the traffic arbitration and prioritization is done by the InfiniBand HCAs and switches in accordance with the priority of each Virtual Lane. For details on how to tell Open MPI which IB Service Level to use, please see this FAQ entry. 41. Does Open MPI support InfiniBand clusters with torus/mesh topologies? InfiniBand 2D/3D Torus/Mesh topologies are different from the more common fat-tree topologies in the way that routing works: different IB Service Levels are used for different routing paths to prevent the so-called "credit loops" (cyclic dependencies among routing path input buffers) that can lead to deadlock in the network. Open MPI complies with these routing rules by querying the OpenSM for the Service Level that should be used when sending traffic to each endpoint. Note that this Service Level will vary for different endpoint pairs. For details on how to tell Open MPI to dynamically query OpenSM for IB Service Level, please refer to this FAQ entry. NOTE: 3D-Torus and other torus/mesh IB topologies are supported as of version 1.5.4. 42. How do I tell Open MPI which IB Service Level to use? The value of IB SL N should be between 0 and 15, where 0 is the default value. NOTE: Open MPI will use the same SL value for all the endpoints, which means that this option is not valid for 3D torus and other torus/mesh IB topologies. NOTE: The btl_openib_ib_path_record_service_level MCA parameter is supported as of version 1.5.4. 43. How do I run Open MPI over RoCE? First of all, what exactly is RoCE? RoCE (which stands for RDMA over Converged Ethernet) provides InfiniBand native RDMA transport (OFA Verbs) on top of lossless Ethernet data link. Since we're talking about Ethernet, there's no Subnet Manager, no Subnet Administrator, no InfiniBand SL, nor any other InfiniBand Subnet Administration parameters. So how does Open MPI run on top of RoCE? OMPI uses the OFED Verbs-based openib BTL for traffic and its internal rdmacm CPC (Connection Pseudo-Component) for establishing connections for MPI traffic. How do I tell Open MPI to use a specific RoCE VLAN? When a system administrator configures VLAN in RoCE, every VLAN is assigned with its own GID. The QP that is created by the rdmacm CPC uses this GID as a Source GID. When OMPI (or any other application for that matter) posts a send to this QP, the driver checks the source GID to determine which VLAN the traffic is supposed to use, and marks the packet accordingly. Note that InfiniBand SL (Service Level) is not involved in this process - marking is done in accordance with local kernel policy. NOTE: VLAN selection in the OMPI v1.4 series works only with version 1.4.4 or later. 44. Does Open MPI support XRC? XRC (eXtended Reliable Connection) decreases the memory consumption of Open MPI and improves its scalability by significantly decreasing number of QPs per machine. XRC is available on Mellanox ConnectX family HCAs with OFED 1.4 and later. See this FAQ entry for instructions how to tell Open MPI to use XRC receive queues. 45. How do I specify the type of receive queues that I want OMPI to use? You can use the btl_openib_receive_queues MCA parameter to specify the exact type of the receive queues for the OMPI to use. This can be advantageous, for example, when you know the exact sizes of messages that your MPI application will use -- Open MPI can internally pre-post receive buffers of exactly the right size. See this paper for more details. In particular, note that XRC is (currently) not used by default. NOTE: Open MPI chooses a default value of btl_openib_receive_queues based on the type of OpenFabrics network device that is found. The text file $openmpi_packagedata_dir/mca-btl-openib-device-params.ini (which is typically $openmpi_installation_prefix_dir/share/openmpi/mca-btl-openib-device-params.ini) contains a list of default values for different OpenFabrics devices. See that file for further explanation of how default values are chosen. NOTE: the rdmacm CPC is not supported with XRC. Also, XRC cannot be used when btls_per_lid > 1. 46. Does Open MPI support FCA? FCA (which stands for Fabric Collective Accelerator) is a Mellanox MPI-integrated software package that utilizes CORE-Direct technology for implementing the MPI collectives communications. A list of FCA parameters will be displayed if Open MPI has FCA support. How do I tell Open MPI to use FCA? 47. Does Open MPI support MXM? MXM is a MellanoX Messaging library which provides enhancements to parallel communication libraries. It is integrated into the Mellanox OFED stack, and also provided in a stand-alone package. NOTE: In Open MPI 1.6 MXM will always be selected, regardless of the number of ranks.